« Poll of the Week. What’s a DM to do? So I was trolling the WotC product catalog and I noticed a book that was absent has made a return to the release schedule. It’s Mordenkainen’s Magnificent Emporium. It’s billed as “A wondrous collection of magical treasures for any campaign.” and shows a release date of September 20, 2011. It was originally scheduled for release in April of this year but was pulled off the schedule sometime in January. Word on the WotC boards and some podcasts was that the content would still be released, but likely digitally. They had said that they were not sure of the best way to release the content. I was one of the many gamers who were disappointed with this change. I had read that this was going to be similar in concept to the earlier Adventurer Vault books but with a greater focus on flavor and story. This is exactly what I had hoped the Adventurers Vault books would have been rather than simple compendiums of magical items. Don’t get me wrong, I love the AV books, but they could definitely be improved with the inclusion of more story elements. WotC has been doing a good job lately in that respect. Products like the Monster Vaults, Shadowfell: Gloomwrought and Heroes of Shadow have done a lot to move the ball downfield with regard to infusing greater amounts of story into the content. I look forward to getting my hands on the newest feast of magical items come September. Here’s WotCs tease for Mordenkainen’s Magnificent Emporium. Few wizards know more about magic than the mighty Mordenkainen, whose arcane achievements are without peer. He’s the Archmage of Adventure . . . and no stranger to unearthing hidden lore. Stand aside, Tenser! Back to the books, Otiluke! Few can match Mordenkainen’s collection of magic items. Still, he hardly seems the type to settle down and open a magic shop. And yet . . . 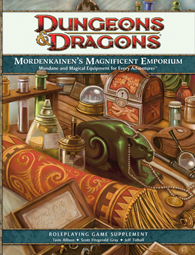 Welcome to Mordenkainen’s Magnificent Emporium, a wondrous collection of magic items—each one with a story to tell. This tome provides Dungeon Masters with a ready assortment of treasures to tempt greedy players, along with historical nuggets and alluring adventure hooks that set these items apart from your run-of-the-mill flaming sword or bag of holding. This book adds rich flavor to the treasures and trinkets presented within, and a dash of inspiration for Dungeon Masters looking to liven up a monster’s trove. Hold on to your magic hats—everything must go! If you’re looking forward to this release, sound off in the comments. Would you like to see greater use of story and flavor in WotC published materials or do you prefer them to maintain the focus on the mechanics and player options they’ve been known for up to this point? If there are other changes to the release schedule that you’ve noticed or are curious about, please let me know.